For over a decade, Orange County Diesel has served tens of thousands, of happy diesel truck owners, both online and in our state-of-the-art service facility, located in Huntington Beach, California. Our indoor service center boasts over 27,000 sqft on a 1.5 acre lot, with (15) service bays housing lifts & diagnostic equipment and indoor staging of another dozen vehicles, including diesel trucks, diesel motorhomes and semi-trucks. For over a decade, Orange County Diesel has served tens of thousands, happy diesel truck owners, both online and in our state-of-the-art service facility. Our indoor service center boasts over 27,000 sqft on a 1.5 acre lot, with (15) service bays housing lifts & diagnostic equipment and indoor staging of another dozen vehicles, including diesel trucks, diesel motorhomes and semi-trucks. Our huge gated and fenced lot has 12 customer service staging spaces, conveniently next to the entrance of our building. The massive outdoor staging and storage area can accommodate another 30 diesel trucks or vehicles, awaiting customer pickup or in line for diesel service or repair. When you bring your truck, motorhome or other diesel vehicle to Orange County Diesel, our service staff will always greet you with a smile and will listen intently, to you, our customer, of the specific issues, needs or dream customizations you would like for your truck. 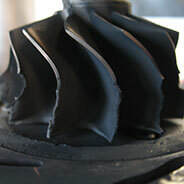 Once a completed list of information is compiled, our expert staff will explain the pro’s & con’s and features & benefits, while going over any service, repair, performance installation or maintenance that's needed, including suggestions that will increase the durability, longevity and performance of your diesel truck or vehicle. 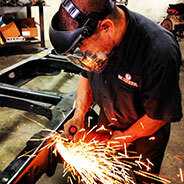 Our team of Master Technicians know diesel . 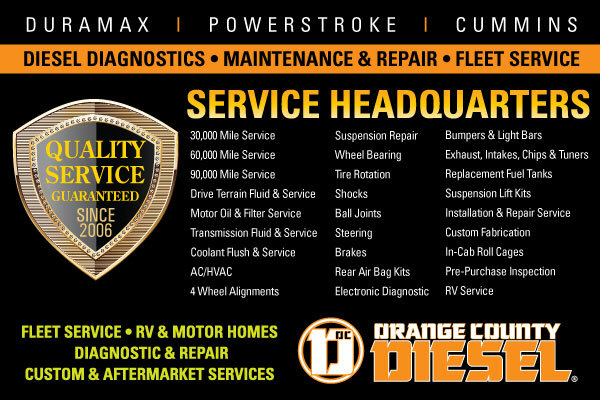 . . before we start any diesel service or repair, Orange County Diesel techs utilize top-of-the-line diagnostic equipment, along with decades of experience, to pinpoint any problems with your diesel truck, allowing us to provide the highest level of service to each and every customer. While abiding by California State Laws, if we sell it, we install it . . . Yep, our diesel techs are experienced experts in diesel performance parts, such as diesel chips, tuners, programmers, air intake systems, exhaust systems, fuel systems, fuel tanks, gauges, injectors, transmissions, truck accessories, and much much more. Many diesel performance products that we offer and sell promote improved towing performance, better fuel economy, lower exhaust gas temperatures, and lower emissions. Free Advice? If you’re in the Orange County area, cruise on by our Huntington Beach location to see what Orange County Diesel can do for your truck, RV or diesel vehicle. From the moment you walk in to the time you drive off, we make sure you have a positive experience and fully understand the condition of your vehicle. We know there’s other diesel service, installation and repair shops from which to choose, and are thankful and value every customer that chooses Orange County Diesel . . . Come and enjoy the Team OCD experience. Performance upgrades for GM Duramax, Ford Powerstroke, Dodge Cummins, diesel motorhomes and more. Hey truck owners, we specialize in Dodge Cummins, Ford Powerstroke and GM Duramax diesel trucks; and we stock a huge selection of performance aftermarket parts to get you powered up and blazing down the road (or dirt), just in time for “that big weekend”. In an effort to be transparent is this digital age of anonymous reviews, we are posting ALL reviews, from ALL sources across the web, unfiltered by us or any other source that chooses what they want you to read. We understand, and hope that you do too, that not all reviews will be positive and we use any criticism as a way for us to improve our services for our Orange County Diesel customers . . . and we hope you, soon will become one too. Copyright © 2015 Orange County Diesel, Inc.